DUBAI // When the world’s tallest building was officially opened on Monday, Sheikh Mohammed bin Rashid, Vice President of the UAE and Ruler of Dubai, had an 828-metre surprise up his sleeve. As tens of thousands of nationals and expatriates waited for what was to be a spectacular fireworks display, it was announced that the tower, known throughout the six years of its planning and construction as the Burj Dubai, was to have a new name: the Burj Khalifa. The change caught everyone off guard, from news organisations, including the BBC, which hours later were still using a name that no longer existed; to the Roads and Transport Authority, which suddenly had to rename the tower’s newly opened Metro station and replace dozens of road signs. But while many were stunned by the name change, one group was also facing an economic shock: the souvenir sellers. Shelves in stores in Karama, the souks and even official merchandise stands yesterday were still laden with goods bearing the Burj Dubai name. Traders said sales of trinkets featuring the world’s tallest tower had noticeably dropped. Orders have been rushed through for large containers of souvenirs bearing the new name, Burj Khalifa, but as the merchandise is manufactured and shipped from China and Thailand, traders were expecting a wait of at least a month until they arrive. Muhammed Salahuden, of Fields Birds Fashion in Karama, has slashed the prices on his remaining stock of T-shirts with a Burj Dubai logo as well as crystal decorative moulds of the tower engraved with the old name. “This is effectively dead stock,” he said. “I still have several cartons, each with 100 crystal decorations in them. “People have already been coming in asking for Burj Khalifa T-shirts and asking why ours have Dubai written on them. He said he was fortunate that “some people are not aware of the name change and I still managed to sell five crystal towers, but sales were a lot higher last week”. The smallest Dh20 souvenir had been reduced to Dh15 while a larger Dh60 version had been slashed to Dh40. Mr Salahuden still had about 50 T-shirts, which are made and printed in India, on sale for Dh15 each. “Even when it was called Burj Dubai, the T-shirts were still not as popular as the ones with camels on them,” he said. He said he is looking into the possibility of having the “Dubai” part of the name scratched off crystal souvenirs and re-etched with “Khalifa” at an engraving factory in Ajman. “It would save a lot of money if we could do that,” he said. The tower’s official store at the observatory on the 124th floor was still selling goods with the old name yesterday, including T-shirts, bags, caps and pens. Sales staff said business was still brisk with the first visitors to At The Top keen to take home a souvenir of the experience. 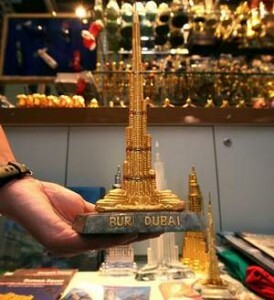 Some traders were predicting that Burj Dubai products might eventually become collectors’ items as they were replaced with Burj Khalifa souvenirs. That could be some time away. The eBay shopping website yesterday was awash with Burj Dubai crystal incarnations selling for Dh143 each.